Giving just comes naturally to our teams. Every year, our caring and compassionate Environmental Services (EVS) team members support local food and toy drives throughout the holiday season. This year, the Welland and Port Colborne EVS teams wanted to change things up. Rather than wait for the holidays, they decided to donate food to community agencies early this year. "We thought it would be a great time to replenish our community cupboards," says Jennifer Ricker- Bonin, Manager, Environmental Services. The team was participating in our workplace 1,000 Acts of Kindness Challenge when they came up with the idea. The teams have collected three boxes of non-perishable food items and will be donating them to a local food bank later this month. They also collected a box of pet food that they are delivering to the Humane Society in Welland. In addition, they have been performing random acts of kindness, including bringing blankets to patients to make their environments more comfortable, buying coffee for the person in line behind them, bringing lemonade and Popsicles to NH team members on hot days, greeting patients, helping visitors find their way, and volunteering their time for community events. 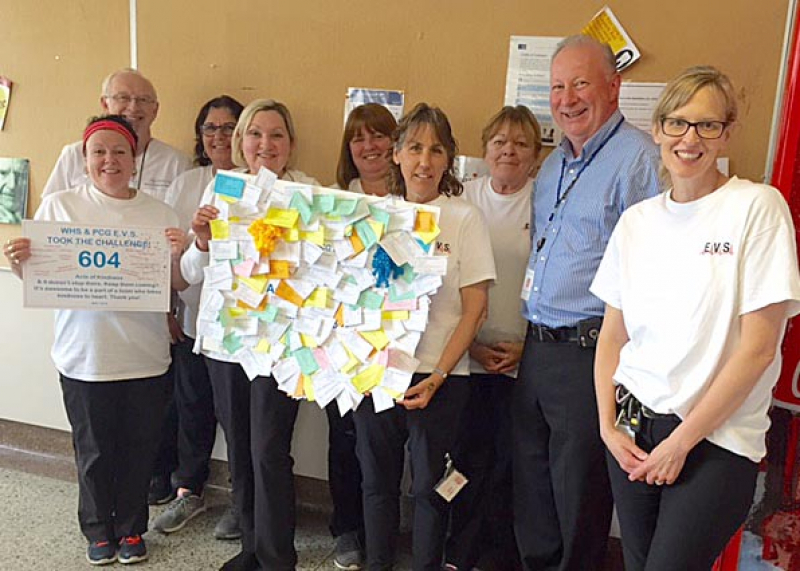 They wrapped up their month-long Acts of Kindness Challenge during Environmental Services Week. The teams gathered on June 4 and 5 to celebrate and acknowledge the work EVS does as “Extraordinary Vital Support” and also their compassionate efforts. "We really enjoyed the Acts of Kindness Challenge," says Jennifer. "It brings awareness to the things we do every day that we sometimes don’t think about." Since the beginning of May, the team has completed 604 acts of kindness and counting. “It’s awesome to be part of a team that takes kindness to heart,” says Jennifer. So far, 15 departments across our sites have completed the challenge.